Mustaches, confetti, empty wine bottles, guys in suspenders and interpretive dance. What else do you want? Oh a ukulele you say? You got it. And did I mention an accordion, brass, violin, tambourine and crashing cymbals? If you're not interested yet, then I'll never be able to convince you to watch today's Music Video Monday. The song is "Elephant Gun". The band is Beirut and the musical genius is Zach Condon. The first I heard of them was a song called, "Postcards from Italy" off of the album, Gulag Orkestar and then "Mimizan" from the compilation album Dark Was the Night. 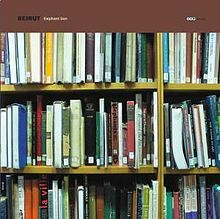 From there, my Beirut catalog has continued to expand. Other songs you might want to check out are "Goshen" & "Santa Fe" from the album The Rip Tide and "Nantes" from The Flying Club Cup. Enjoy your Monday and remember to live your soundtrack out loud. Please give me the most practical evaluation. Please share to help me !! !